A brain tumor, or tumor, is an intracranial solid neoplasm, a tumor (defined as an abnormal growth of cells) within the brain or the central spinal canal. Brain tumors include all tumors inside the cranium or in the central spinal canal. They are created by an abnormal and uncontrolled cell division, usually in the brain itself, but also in lymphatic tissue, in blood vessels, in the cranial nerves, in the brain envelopes (meninges), skull, pituitary gland, or pineal gland. Within the brain itself, the involved cells may be neurons or glial cells (which includeastrocytes, oligodendrocytes, and ependymal cells). Brain tumors may also spread from cancers primarily located in other organs (metastatic tumors). Any brain tumor is inherently serious and life-threatening because of its invasive and infiltrative character in the limited space of the intracranial cavity. However, brain tumors (even malignant ones) are not invariably fatal, especially lipomas which are inherently benign. Brain tumors or intracranial neoplasms can be cancerous (malignant) or non-cancerous (benign); however, the definitions of malignant or benign neoplasms differs from those commonly used in other types of cancerous or non-cancerous neoplasms in the body. Its threat level depends on the combination of factors like the type of tumor, its location, its size and its state of development. 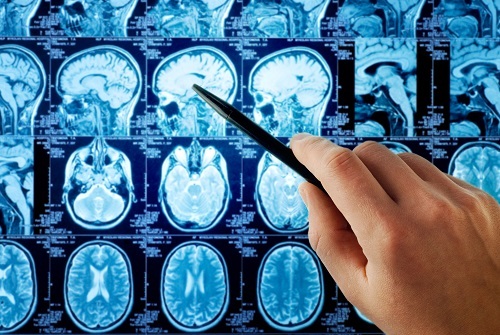 Because the brain is well protected by the skull, the early detection of a brain tumor occurs only when diagnostic tools are directed at the intracranial cavity. Usually detection occurs in advanced stages when the presence of the tumor has caused unexplained symptoms. Complete or partial resection of the tumor with the objective of removing as many tumor cells as possible. The primary and most desired course of action described in medical literature is surgical removal (resection) via craniotomy. A craniotomy is a surgical operation in which a bone flap is temporarily removed from the skull to access the brain. The most commonly used treatment for brain tumors; the tumor is irradiated with beta, x rays or gamma rays. Radiotherapy may be used following, or in some cases in place of, resection of the tumor. Forms of radiotherapy used for brain cancer include external beam radiation therapy, brachytherapy, and in more difficult cases, radiosurgery, such as Gamma Knife, Cyber Knife. Radiotherapy is the most common treatment for secondary brain tumors. The amount of radiotherapy depends on the size of the area of the brain affected by cancer. Conventional external beam ‘whole brain radiotherapy treatment’ (WBRT) or ‘whole brain irradiation’ may be suggested if there is a risk that other secondary tumors will develop in the future. Stereotactic radiotherapy is usually recommended in cases involving fewer than three small secondary brain tumors. It is a treatment option for cancer, however it is seldom used to treat brain tumors as the blood and brain barrier prevents the drugs from reaching the cancerous cells. Chemotherapy can be thought of as a poison that prevents the growth and division of all cells in the body including cancerous cells. Thus the significant side effects associated and experienced by patients undergoing chemotherapy.